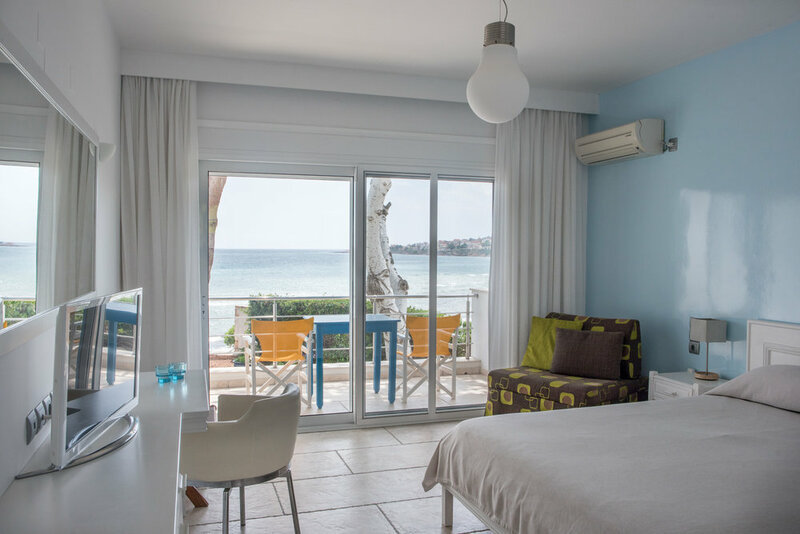 Directly on the sandy beach of Karfas, in a quiet and dreamy part of the islands’ most popular holiday spot, you find Sideratos Apartments. They were built in 1970 and fully renovated in 2008 and are decorated in a nice and friendly atmosphere. Each apartment has a spacious living room furnished with a double bed or two single beds, a comfortable chair that becomes a third bed and a wardrobe. For children up to 3 years old we have foldable baby beds with extra mattress. The large French windows open to a big private balcony with full sea view. Our apartments are self-catered. All 7 units include bathroom with shower and toilet. A fully equipped kitchen makes it possible to easily prepare meals "at home". 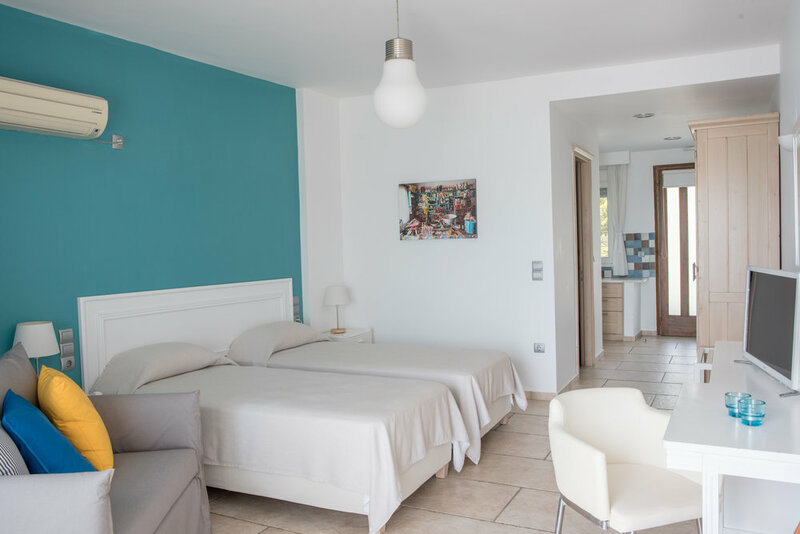 Standard facilities in each apartment are: wireless internet access, TV, air conditioning, heating, safety box, filter coffee machine, electric water kettle and hairdryer. Nespresso machine and bread toaster are limited available upon request. Besides sheets and bath towels we also provide towels for the kitchen and the beach. Sideratos Apartment guests are welcome to use the swimming pools and playground of the 5 star hotels nearby. To sign up to receive our emails, please fill in your email. We will inform you about special offers and any upcoming events on Chios. So stay tuned! Sideratos Apartments rents out 7 comfortable, self-catered apartments at the beach of Karfas, on the island of Chios, Greece. 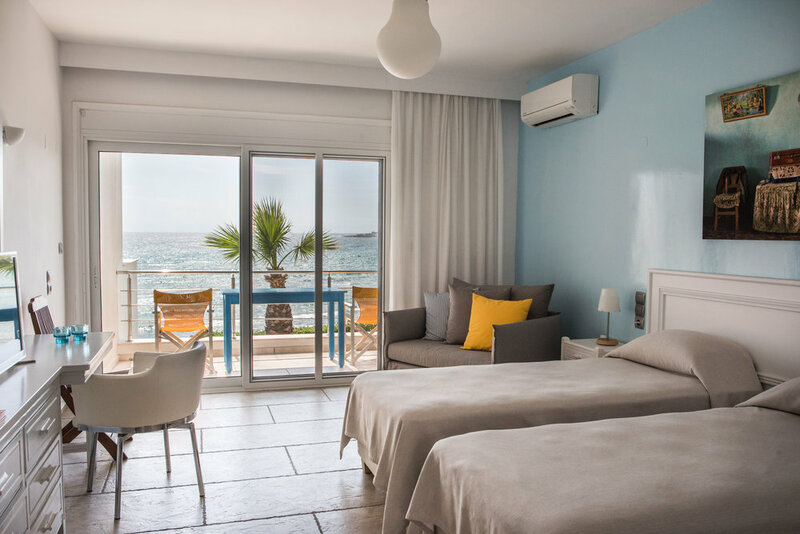 All apartments are directly located by the sea, each with beautiful sea view, attractively furnished and equipped with all the necessary household appliances.